I have covered Pale Horse Brewery before, including a full brewery tour and interview, so I’m a bit of a fan of the brewery and the team behind it. 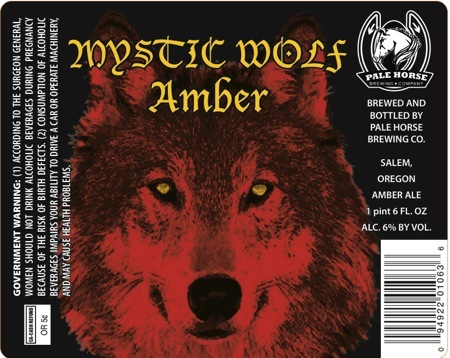 The Pale Horse guys have a brand new beer out called Mystic Wolf Amber. Let’s dig in and see how this new beer rates. As a fan of Amber ales, I will rate Mystic Wolf against other offering from Widmer, Full Sail and other smaller breweries. First of all, in appearance, Mystic Wolf is very copper-like in color. Some ambers look more like a pale ale, but not with this brew, it’s a deep reddish color that sets your expectation for a strong taste. It’s smell is very plain – with no hoppy hints or strong aromas. At first sip, the beer has a slight bitterness to it that is followed by a malty second wave that leaves you satisfied and wanting another hit. This is a very well balanced beer that has a medium-powered initial taste with a very smooth and satifying aftertaste. All in all, Mystic Wolf is an amazing contender in the world of amber ales. I highly suggest it, and this is coming from a beer enthusiast that tastes a lot of beers in this category. The weekend is upon us and it’s time to consider what we’ll be drinking on this hot summer weekend. It seems like the entire nation is gripped by a heat wave, so what this weekend calls for is a cool, crisp ale that goes down easy and leaves you feeling refreshed. Cascade Lakes Brewing of Bend and Redmond, Oregon has just the brew. Roster Tail Ale was the breweries first beer ever made and sold and continues to be a regional favorite. Rooster Tail Ale is a golden-colored ale that has 5.2% alcohol and only 30 I.B.U.s that makes for a very easy-drinking beer. In opinion, Roster Tail is *too* easy-drinking. I’m a fan of crisp summer beers, especially those of the Kolsh variety, but Rooster Tail left me wanting more. It has a decent taste, but doesn’t have enough flavor or effect to leave me wanting a second sip after the first. For those wanting a more memorable easy-drinking ale for a summer day, I’d skip Rooster Tale and pickup a Mirror Pond Pale Ale from Deschutes. Cascade Lakes makes many great beers, but Rooster Tail simply isn’t one of them. On the “The Early Show on Saturday Morning” on CBS recently, the program highlighted 5 beers. What is absolutely great is that all of the beers highlighted are from the great state of Oregon! We have a reputation for being nuts about beer and it’s great to see some great Oregon brews put into the national spotlight. Which beers did they choose? They discussed 5 beers from 5 different breweries all around the state, stretching from Portland, to the coast, then all the way inland to Central Oregon (my favorite part of the state). Widmer Hefeweizen: A great American version of a German wheat beer. It’s a little tangy, and very refreshing. A great summer beer. I’d pair it with grilled seafood, raw oysters, that sort of thing. Full Sail Session Lager: The beer world divides its product into lagers and ales; it has to do with the type of yeast used and the brewing process. But an easy rule of thumb is that lagers are like white wine (lighter, crisper), and ales are like red wine (bigger, richer, more powerful). Full Sail makes a great, tasty lager, good with almost anything. Personally, I’d drink it with hot dogs off the grill, but it’s also a classic all-purpose beer: chicken, potato chips, pretzels, you name it. Deschutes Green Lakes Ale: This is an ale, so it’s richer and darker than the Full Sail Session Lager. What’s especially cool is that it’s made from organic ingredients. Deschutes is based in Bend, Ore., but it has a brewpub in Portland, too. I’d drink this with a hamburger; for me, ales like this are ideal burger wines. Bridgeport IPA: Another ale; this was a style invented by the British, called India Pale Ale. Hops, one of the ingredients of beer, act as a preservative, so the British made an especially hoppy brew to ship on the long voyage to India. Hops also add flavor-a kind of citrusy, piney, bitter note that’s very pronounced in IPAs. I think they’re great with fried foods — anything from fried shrimp to French fries — the bitterness kind of wakes up your mouth after all that rich fried coating. Rogue Dead Guy Ale: This is a darker, more intense style of ale (technically, it’s a German style called a Maibock). It’s a bit higher in alcohol — 6.5 percent — with a toasty, malty character and real texture to it. This is my go-to for big, spicy foods: sausages on the grill, barbecued ribs, that kind of thing. Kudos to these Oregon brewers for churning out great brew and getting some well-deserved recognition! July Is Oregon Craft Brew Month! July is obviously my month! First of all, my birthday is coming up, and secondly…it’s Oregon Craft Brew Month! Oregon has an amazing brewing industry and it’s great to see an event to bring everyone together to celebrate our unique beer culture. I’ll be visiting some breweries in Bend, Oregon – right in the heart of Oregon to kick things off. Also, there are many events happening and they are visible over at the Oregon Craft Brew website and also at their Facebook page. Check out events near you and celebrate Oregon beer! You are currently browsing the Pints And Steins weblog archives for July, 2010.